As a national political correspondent for NPR, Mara Liasson unbiasedly covered every presidential election from Clinton to Obama. She dug into administration and policy as a White House and congressional reporter. Now, you can hear her provocative take on all things politics on “All Things Considered” and “Morning Edition” and as a Fox News contributor. 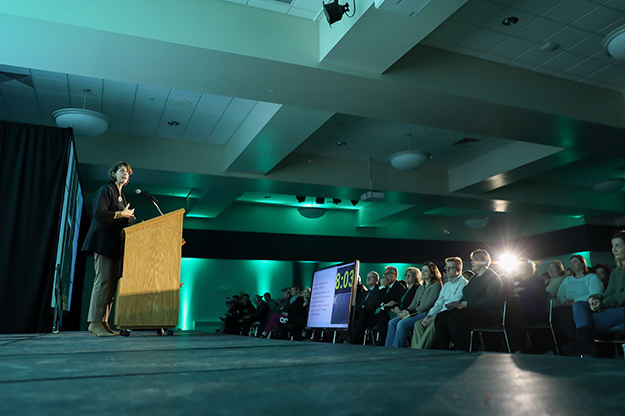 But Tuesday evening, before more than 450 people packing the University of North Dakota’s Memorial Union, Liasson felt a sense of reprieve. “I’m grateful for the opportunity to take a break from my regularly scheduled programming, when, depending on what day it is, I’m not sure if I’m covering ‘House of Cards,’ ‘The West Wing,’ ‘The Sopranos,’ or ‘King Lear,’” Liasson said to the laughter of those filling the ballroom. Liasson was the keynote speaker of the 13th Olafson Ethics Symposium, hosted by the College of Business & Public Administration (CoBPA) and sponsored by alumnus Bob Olafson and SEI Investments. Olafson established the series to foster student and community discussions of professional and personal ethics. As conversations over “fake news” bubble across the nation, Liasson offered her no-nonsense view on the state of ethical standards and civic virtue. She noted that in the current political environment, American ideals are becoming more divided as ethical norms are stretched. “All of our democratic institutions right now are undergoing a kind of stress test, and all of things that are supposed to bind us together and make it possible to find common ground are under tremendous pressure,” she said. These stress tests – driven primarily, Liasson said, by what she sees as the divisive commentary of President Donald Trump – are disturbing the judiciary and congressional branches of our government. But the media has been the most visibly afflicted. “There are direct attacks on the mainstream press as ‘fake news.’ We’ve heard the President threaten to get rid of the license of NBC because he didn’t like what they were reporting,” Liasson said, offering further examples of intimidation. She posed that the assaults have a strategy behind them – to crack the credibility of “unkind” coverage – and the strategy is working. “The corrosion of support for First Amendment principles did not start with Donald Trump – he just accelerated it,” she said. 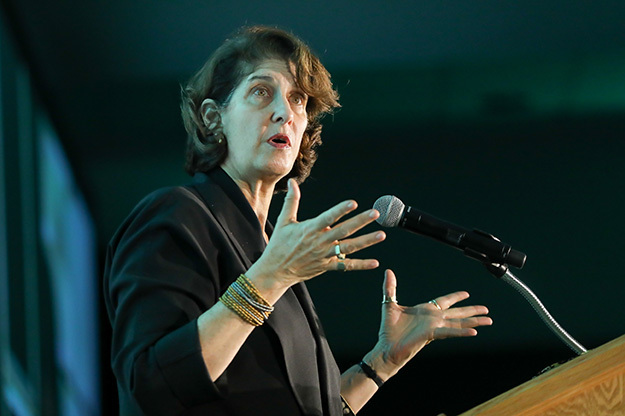 More than 450 people packed the University of North Dakota’s Memorial Union Ballroom to hear NPR’s Mara Liasson speak on Tueday, Nov.7. Photo by Shawna Schill/UND Today. Liasson explained the layers of “fake news” – some fact-based news is labeled fake to discredit it, and some genuinely fake news is propagated as truth, like in the cyber campaigns of the 2016 election. Unfortunately, she said, people consume what they agree with, and fact-checking in the media no longer matters. “Our system is becoming reality-resistant. And for a system that’s based on compromise and cooperation and restraint, if we no longer agree on the facts, and then work our way to opinions – as opposed to vice versa – how are we going to have a civil debate?” she wondered. 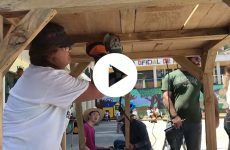 But Liasson came armed with solutions, telling the crowd to avoid fake news by pursuing primary sources, using news aggregators for a full spectrum of views, and fact-checking with sites like Snopes. She urged listeners to seek out ideas that are different from their own by surrounding themselves with community voices and prescribed advocating for a K-12 civics curriculum and supporting fact-based journalism and local news. 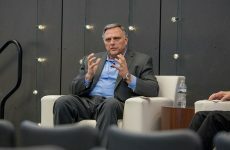 Despite journalism’s current challenges, Liasson argues that the field is experiencing a “Golden Age.” Web traffic is rising on sites for mainstream outlets like CNN, the New York Times and the Washington Post. 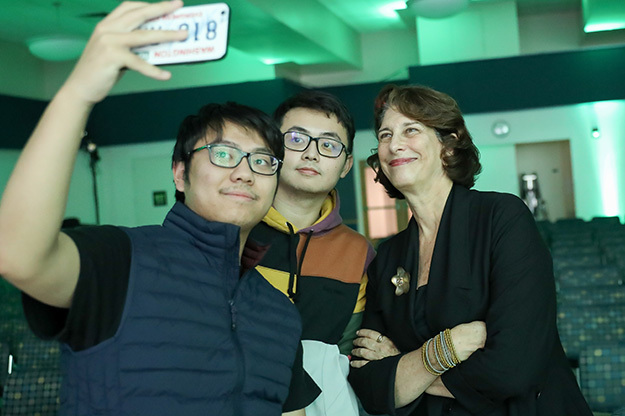 During her visit to UND on Tuesday, NPR’s Mara Liasson told aspiring newshounds that the industry is hard, but “if you are a good writer, you’re really interested in your subject matter, and you’re adept at providing content on all platforms … you can do really well.” Photo by Shawna Schill/UND Today. At the end of the keynote, interim CoBPA Dean Steve Light asked the students in the audience to raise their hands – showing their overwhelming majority – and noted their engagement in the conversation. Senior Marketing and Communications double major Dayna Bastian was invited to a student-centered session with Liasson earlier in the day. She said Liasson taught her that the discussing ethical divides is essential for leaders in action. “We all need to look forward into the future at what we really want ethically and morally as American citizens,” the Shakopee, Minn. native said. As the symposium’s founder, Olafson said the incredible turnout indicates the quality of student UND develops. 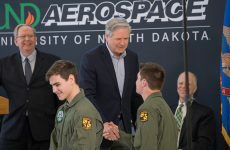 “It’s really energizing to come back and see how enthusiastic they are and how excited they are about their education and the careers they’re preparing for, and to see their interest specifically in ethics,” he said.